In Episode #402, Eric and Neil discuss how to build a strong corporate brand using social media. Tune in to learn how you can strengthen your brand through social media and how you can fast track the growth process by using strategies that have worked for some key companies today! 05:05 – That’s it for today’s episode! Social media platforms are great for growing your brand for the mere volume of traffic you’ll encounter. Make your brand appealing to people so they’ll spread the word and grow your following. Tap into micro-influencers within your niche and strike a deal that will benefit both parties. Speaker 1: Get ready for your daily dose of marketing strategies and tactics from entrepreneurs with the guile and experience to help you find success in any marketing capacity. 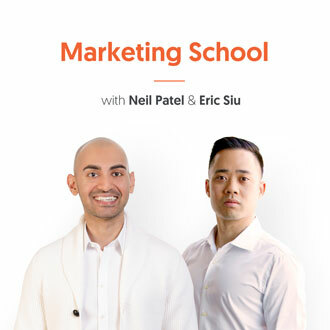 You're listening to Marketing School with your instructors, Neil Patel and Eric Siu. Eric Siu: Welcome to another episode of Marketing School. I'm Eric Siu. Neil Patel: And I'm Neil Patel. Eric Siu: Today we're going to talk about how you can build a strong corporate brand using social media. Who actually has a strong corporate brand that they've built using social media? I'm trying to think right now. Do you know? Does anybody come off the top of your head? Neil Patel: Yeah, there's quite a few, like Force Farm, it's on Instagram, right? I see them everywhere. Shreds used to have one. Fit tea huge. All those teeth whitening companies, you're seeing all the swimwear companies like Dolce swimwear and stuff like that. Neil Patel: It's all through social media. Eric Siu: Yeah, you know what's actually interesting, I actually somebody on growth everywhere last week, and she has 16 million followers spread across different Instagram accounts. I think her company is called skinny T or Fit tea, something like that, or did you just say Fit tea? Eric Siu: Like the actual tea, drinking tea? Eric Siu: Okay, I think we're talking about the same girl so, check out this person or you can do just google Greta Van real, I think and she's based in Australia but she has a crazy story. She's basically said, when she started with Instagram, a long time ago, she would just find kind of micro influencers reach out to them, send them products, things like that and that's how she built her brand and then that's how she eventually started to get millions of followers. She first started giving away stuff in the beginning and then afterwards, what she did was, I believe she started to create different types of phrases to write, she coined a term tea talks right? So, that's just detoxing using tea and she created a movement behind that. So, when you want to create a brand that people stick to, you create a movement, you connect with a lot of micro influencers in the beginning and then you just keep building and building on that, and then that's how she built her social media empire and like everything she does now, she has a template and she just takes it across a different eCommerce company that she's building. Neil Patel: Check out a company called sunny CO clothing, they produce swimwear and they did something that was really creative with social media, they created a funnel, and you can do this too, it pretty much told everyone on Instagram that you can get a free swimsuit if you post the image and you tag them or something like that. And, all you have to do is pay for shipping right? You marketers all know the scheme, it's still a good deal and there's nothing wrong with it, it's nothing unethical. You're just telling people that, "Hey, you get the product for free but you pay shipping." You get them to pay the shipping upon check out, you do some upsells and down sells, you instantly have a profitable campaign. I works so well, you should test it out. And, if you at Google Trends and you type in sunny CO clothing right? You'll see a huge strike. It did extremely well for them. Eric Siu: Yah when I'm looking at these I mean, large co operations can definitely use this but if you're starting out, when I look at Greta, just looking at her story I mean when she launched everything, it took her about six months or so to get to 600 thousand dollars the monthly recurring revenue. So, that's a 7.2 million dollar a year annual run rate, but again she's duplicating across different brands that she's building now and she even has a course now on how to actually build a social media brand and then use it to deploy on an eCommerce. So, highly recommend checking that out, I think there's a lot more in there we can't really distill five minutes or so but Neil, do you have anything else you want to add? Neil Patel: No, it's also consistency, you're not going to build a social media brand or a brand for your co-operation using social media unless you're consistent. I'm not talking about doing stuff once a month or once a week. I'm talking about participating on the social sites daily. That's the only way. Eric Siu: Great, so that's it for today, but before we go, we have a one-year annual subscription of crazy egg, which is worth close to 1200 dollars that we would like to give away. Before I give you details on that, Neil, what is crazy egg? Neil Patel: Crazy egg is a visual analytics tool. When you look at data within Google Analytics you're probably wondering, "Wow, this is overwhelming. What do I do with this?" All at crazy egg you get visual reports that'll tell you what's wrong with your website, why people aren't converting, what changes you need to make. From heat maps to scroll maps to confetti reports to even visitor recording to show you video views of where people are getting stuck. Crazy egg will show everything in visual format so you know what changes to make. And then, once you have that down, you can actually make the changes within crazy egg using the WYSIWYG editor and then you can run A/B test within crazy to make sure that your changes are helping improve your leads, your sales and your revenue. Eric Siu: Great. So, if you want to get under this, all you need to do is go singlegrain.com/giveaway, we're giving away one of these every single week, and the cool thing is, you can actually get multiple entries to this giveaway, so again go to singlegrain.com/giveaway, and we will see you tomorrow. Speaker 1: This session of Marketing School has come to a close. Be sure to subscribe for more daily marketing strategies and tactics to help you find the success you've always dreamed of. And, don't forget to read and review so we can continue to bring you the best daily content possible. We'll see you in class tomorrow right here on Marketing School.